By all measures, my cousin Orville Bodtker was a very unlucky young man in World War II. But I think for sheer, unrelenting misfortune, I have to turn to the story of my great-great-grandparents, Robert Ransom and Emma Jenkins, the parents of Clara Pearl Ransom. Emma Jenkins was born 24 Aug 1835 in Springboro, Ohio, the fourth child born to Henry Zane Jenkins and Abigail Bedford.3 Emma was just two when the Jenkins family moved to Jay County, Indiana, in 1837.4 Though they were in different counties, the Ransom and Jenkins families were just a few miles apart, on either side of the county line. Robert and William Ransom went to California during the gold rush and due to lack of funds and a poor choice in transportation, it took them eight months to get from Indiana to San Francisco.6 Despite that inauspicious start, Robert and William did find some financial success out west, mostly by farming, not mining. Robert headed home to Emma in January 1855, carrying part of his money in a money belt, and sending the remainder by Adams Express – just in time for the collapse of Adams Express in the wake of a banking scare.7 This was the first of the misfortunes. Robert and Emma were married that March.8 They had planned to go to California, but Emma was pregnant, and Robert’s parents needed him at home. With the help of Henry Jenkins, Robert established a store at the Trenton, Indiana, crossroads.9 He engaged in several businesses, according to daughter Clara, and was generally successful. He was also a lay preacher in the Methodist Episcopal Church and by all accounts a moral man. The three brothers began speculating in real estate, leveraging their purchases with large mortgages. On 19 May 1879, their rash investing behavior came back to bite them and they were forced to close the bank.14 Lawsuits began in earnest, as Robert and Bazel’s creditors began calling in their notes. The properties securing them could not be sold to cover the debts.15 Robert and Emma lost everything. Fleeing the disaster they’d created, Robert and Bazel moved their families to Kansas; William moved to Michigan. Robert went into the mercantile business with his brothers-in-law in Independence. He seemed to be putting his life back together, though the lawsuits back in Indiana continued. In January 1883, Robert was called to jury duty in Independence. Reportedly caught outdoors during a storm during this service, he came down with pneumonia. Days later, on 1 Feb, he was dead at age 52.16 Emma was left with three minor children to rear on her own. Even after Robert’s death, she continued to be a defendant in the Indiana lawsuits. Emma eventually moved to Moscow, Idaho, following her son, Arthur, who worked for the railroad. She still had two minor children at the time, Fred and Clara. In 1899, Emma’s daughter, Emma Louella Hockett, died in Kansas, leaving two small children.17 Emma went to Kansas and brought her grandchildren to Idaho to bring up. But shortly after, she fell victim to a stroke and Clara had to take responsibility for the children. Feature image: Clara Pearl Ransom and Emma Jenkins Ransom on their porch in Moscow, Idaho, about 1900. Courtesy of the Special Collections Library, University of Idaho. Emma grew up in abject poverty and was no stranger to hard work, but it’s hard to imagine losing so many children, everything you’ve worked for and then your husband, too. And both her parents died just prior to that. So many of our ancestors had to endure this and so much more. When I learn about the life they had to live I feel very small. I do feel “soft” compared to my ancestors. Modern life is pretty easy by comparison. This puts a series of unfortunate events to shame. Good grief. An entertaining piece though. Makes me feel how lucky I am. 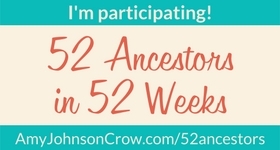 I feel lucky every time I do research on my ancestors. My parents were able to ensure I had my physical needs met and also that I was well-educated. Good genes help, too! Agreed. My family all seems to near the 100 mark before dying, and stay pretty healthy all the way through. It is nice to live without losing a child. Or seven! Wow. That is tough. It is hard for me to fathom how one goes on after losing children so many times. According to family lore, Emma did have a breakdown, but I’ve never found the evidence to support it. It certainly wouldn’t be surprising! What misfortune. Wouldn’t be surprised if Emma had a breakdown, she had quite a lot to deal with during her life. I’ve known people to crack under far less strain, for sure.